Do you have a rate sheet? I recently had a HUGE eye opener when I decided to join Social Bluebook and plug in my Blogs Google Analytics and a few Social Media Channels. If you don’t know what Social Bluebook is, then let me bring you up to speed. 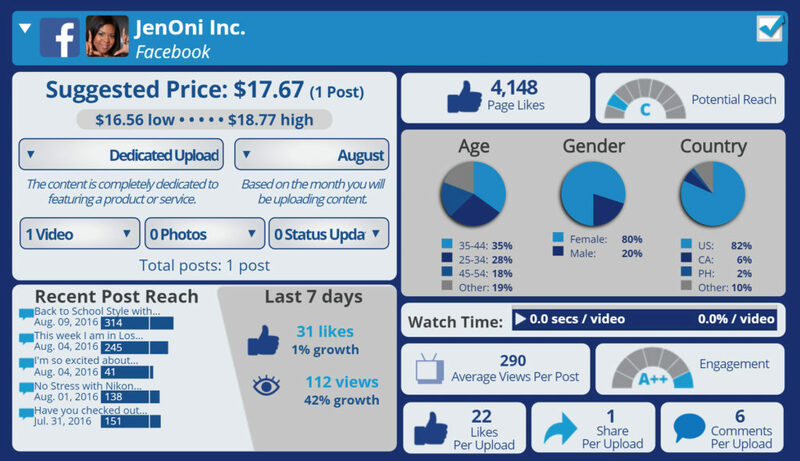 Social Bluebook is a platform that calculates the suggested prices that you should quote and negotiate based on your social media reach, viewership, engagement, followers, genre and demographics. You also have the option to send verified quotes to potential clients. Knowing my brands worth was a bit difficult because I’m usually accepting blog campaigns through blogger networks. I JUST started to negotiate independent influencer campaigns on my own with PR companies and brands. Once I entered my information into Social Bluebook I realized I was really shorting myself by 50% on one of my highest following and engaged social networks. I immediately started to reevaluate my way of thinking and decided I was going to create a free standing rate sheet for online campaigns. The social media accounts you can currently link to Social Bluebook to measure your value are YouTube, Twitter, Facebook, Instagram, Vine and your Google Analytics. It’s a very easy process and will immediately calculate your quote giving you a base to start with and high quote. You can also adjust what and how you will share the content. It also allows you to change when you will share the content and these adjustments affect your quote. You can always refresh to get an accurate quote. Brands have the opportunity to join and have access to the influencers allowing them to view your overall value as well as your worth on each platform. They can pitch you with a quote based on your Social Bluebook value and you can negotiate your price based on your value and rates. I think this is a great tool to use when working independently with brands. I also learned recently not to be afraid of pitching back in a blogger network. I just assumed the pricing was all written in stone! It’s been roughly 72 hours since I’ve been using Social Bluebook and I have negotiated $1000 in social media influencer opportunities and guess what?!?! The brands accepted the rates that I quoted. They were based on using Social Bluebook to calculate my brands worth. I am using Social Bluebook as a gauge and may still accept opportunities that are below my suggested rate based on the brand and if I really want to work with them. I like knowing the value of each platform and a total value based on all platforms currently being measured. 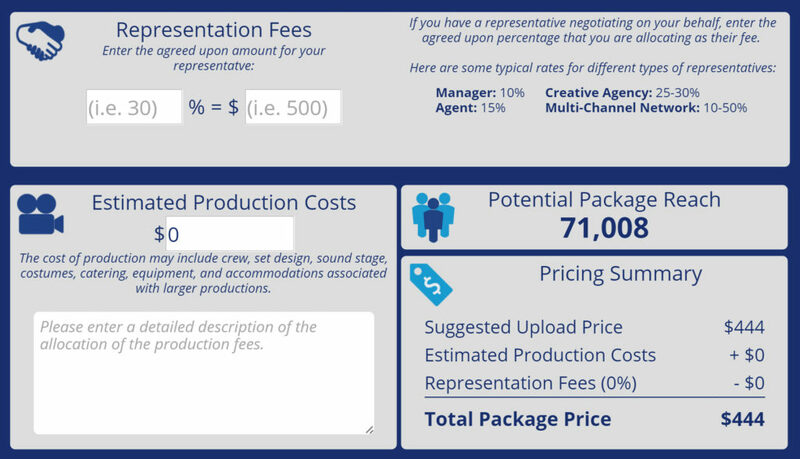 You also have the option to add representation fees and production costs if necessary. Bonus: I consider myself a SMedium Blogger. I’ve been at this for seven years but, I’m still growing my online community and social following. My pain points are consistency and engagement. I’m a FT WAHM with four children and I do a lot of daily juggling! I shared my Blog, Facebook, Twitter and Instagram Social Bluebook Rates with you so you can get a sense of what it looks like and how I come up with my rates. I’ve definitely been paid above and beyond the suggested rates on certain platforms. It’s all in your pitch! Tell them what you can do for them and set yourself apart from others. Also, include your channels not listed on Social Bluebook where you have a good following and reach. Now get to negotiating! Great post! Thanks for the insight! You sold it well! Congrats on your success! Thank you Jenoni for sharing this information. We certainly go farther together than we ever do alone. It has only been 5 months since I purchased my domain for my site. I have a long way to go but this will certainly assist. Mimi, I’m glad you found the information useful. It’s a great tool! I’m such a foodie and will be following along on your adventures. I agree that it’s important to have a good idea of how much your brand is worth. No matter if you always want to charge the full amount, or offer deals to clients with whom you really would like to work, at least knowing your value help reduce self doubt and hesitation while haggling. I also think that most people like better when you quote a fair price and then overdeliver, than just doing an okay job for a very low price. Great post overall and keep up the good work!